Carl Milton Levin (born June 28, 1934) is a United States Senator from Michigan, serving since 1979. He is the Chairman of the Senate Committee on Armed Services. He is a member of the Democratic Party. He has been Michigan's senior senator since 1995. He has served as a U.S. Senator longer than any Senator in Michigan history. He was elected to a sixth term in 2008, which will end in January 2015. He is the younger brother of U.S. Representative Sander M. Levin. Levin was born in Detroit to Jewish parents Bess Levinson and Saul R. Levin. He attended Detroit public schools and graduated from Swarthmore College in 1956 and from Harvard Law School in 1959. Soon after earning his law degree, he was admitted to the Michigan bar and opened a practice in Detroit, where he still lives. He received honorary degrees from Michigan State University in 2004, Wayne State University in 2005, and Michigan Technological University in 2008. He was state assistant police officer and general counsel for the Michigan civil rights commission from 1964 to 1967. He was special assistant attorney general for the state of Michigan and chief appellate defender for the city of Detroit from 1968 to 1969. He was a member of the Detroit City Council from 1969 to 1977, serving two four-year terms, the last four years as council president. Levin is currently the chairman of the Armed Services Committee. He has served as the Democrats' ranking member on the committee since January 7, 1997. Levin previously chaired the committee when the Democrats were the majority party in the Senate, January 3–20, 2001 and June 6, 2001 – January 6, 2003. He is a strong advocate for cost controls regarding military procurements. He has also pushed for less secrecy in government, working to declassify many documents, particularly where claims of ties between Iraq and al-Qaeda are concerned. Levin voted against sending troops to Iraq and repeatedly called on the Bush administration to provide a timetable for the withdrawal of troops. Levin has argued strongly that the war in Iraq is a diversion from the War on Terror. On CNN on November 14, 2005, Levin said that "before the war, the President was saying that you cannot distinguish between Saddam Hussein and Iraq. As a matter of fact, he said that so often that he tried to connect Saddam Hussein with the attackers on us, on 9/11, so often, so frequently and so successfully, even though it was wrong, that the American people overwhelmingly thought, because of the President's misstatements that as a matter of fact, Saddam Hussein had participated in the attack on us on 9/11. That was a deception. That was clearly misinformation. It had a huge effect on the American people." Some have argued[who?] that this contradicts statements Levin made before the March 2003 beginning of major combat in Iraq. On CNN's Late Edition on December 16, 2001, he said that "The war against terrorism will not be finished as long as [Saddam Hussein] is in power." And as the Chairman of the Senate Armed Services Committee, he said during a hearing on September 19, 2002, "We begin with the common belief that Saddam Hussein is a tyrant and a threat to the peace and stability of the region." The Prime Minister of Iraq, Nouri al-Maliki, has hit back at senior U.S. politicians who have called for al-Maliki to be removed from office. He singled out Levin and Hillary Clinton, saying the Democratic senators were acting as if Iraq was "their property" and that they should "come to their senses" and "respect democracy". Leaders in both the U.S. and Russia have recently expressed interest in exploring missile defense cooperation. Did you ever believe that some of our missile defense engineers and experts might be working together with their Russian counterparts? It could happen and if it does, it could help address a major threat. The bottom line is simple: We have a new opportunity to seek a cooperative approach with Russia on missile defense, and we should seize it. The upside potential of such an effort is huge — a geopolitical game changer. The downside is minimal. Levin was a strong supporter of the creation of The Department of Education. Over the years, Levin has introduced legislation and amendments to improve education, including an amendment that greatly reduced class sizes to help teachers better focus on the needs of each specific child. Levin was a hesitant sponsor of the No Child Left Behind Act, and still believes that the United States Congress should examine the effects of the Act. Levin was also disappointed with the final draft of the No Child Left Behind Act because it cut much of the increased funding for children with disabilities that was initially promised. Senator Levin has directed the Homeland Security and Governmental Affairs Permanent Subcommittee on Investigations to investigate whether Department of Energy policies have caused a rise in the price in crude oil. He also led an investigation in 2001 to try to discover the cause of the spike in gasoline prices that summer. In 1999 Levin obtained $56 million for the Detroit Riverfront Project. The funds will be used in part to acquire land for a major five-mile walkway and greenway along the Detroit River. The Detroit Riverfront has been contaminated for decades by pollutants from factories that once operated there. 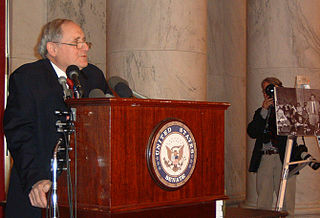 Senator Carl Levin announces at a press conference regarding his opposition to the War in Iraq and his willingness to vote "No" on the authorization to give President George W. Bush the right to invade Iraq. Levin is an advocate for stem-cell research because of its potential to cure diseases like Alzheimer's, diabetes, and Parkinson's. 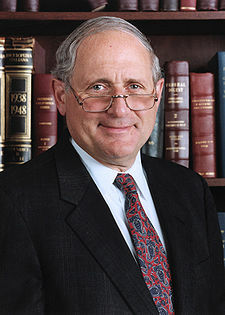 Carl Levin initiated the Stop Tax Haven Abuse Act against alleged tax havens such as Liechtenstein. For the state of the initiative against tax avoidance and tax evasion registered as S.506, and the complementary initiative H.R.1265, see: Thomas (Library of Congress). Levin faced a tough reelection bid in 1984 against former astronaut Jack R. Lousma, winning by only four percent. However, he routed Congressman Bill Schuette in 1990, and was reelected in 1996 and 2002 against only nominal Republican opposition. In 2002, Levin garnered 61% of the vote against Republican Andrew "Rocky" Raczkowski despite the then-high popularity of President George W. Bush and the GOP and a close gubernatorial race that year. In the 2008 election Levin won by a comfortable margin against state representative Jack Hoogendyk. Levin's family has long been active in Michigan politics. His older brother, Sander M. Levin, has represented Michigan's 12th congressional district in the House of Representatives since 1983. Sandy's son (Carl's nephew) Andy Levin was a policy analyst for the AFL-CIO and later ran unsuccessfully for the Michigan Senate. Carl's uncle Theodore Levin, was a chief judge on the U.S. District Court for the Eastern District of Michigan. Carl's first cousin Charles Levin was a Michigan Supreme Court judge; another, first cousin, Joseph Levin, was a candidate for the House. ^ "Carl Levin". New York: Nydailynews.com. http://www.nydailynews.com/topics/Carl+Levin. Retrieved 2010-05-27. ^ "1<!- Bot generated title -> Rootsweb.com". Freepages.genealogy.rootsweb.com. 1934-06-28. http://freepages.genealogy.rootsweb.com/~battle/senators/levin.htm. Retrieved 2010-05-27. ^ "Carl Levin — U.S. Senator from Michigan". Levin.senate.gov. http://levin.senate.gov/about/. Retrieved 2010-05-27. ^ "Chairman Offers Tough Scrutiny of Military". Roll Call. 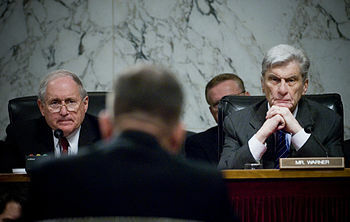 2010-05-24. http://www.rollcall.com/issues/55_137/ci_senate_armed_services/46570-1.html. Retrieved 2010-08-29. ^ "Pentagon's future fighter aircraft doubles in cost". CNN. March 12, 2010. http://www.cnn.com/2010/POLITICS/03/12/pentagon.f35/index.html. ^ "Maliki returns fire at US critics". BBC News. 2007-08-26. http://news.bbc.co.uk/2/hi/middle_east/6964677.stm. Retrieved 2010-05-27. ^ York, Anthony (2002-03-14). "Salon.com". Dir.salon.com. http://dir.salon.com/story/politics/feature/2002/03/14/cafe_standards/index.html. Retrieved 2010-05-27. ^ "C:\DOCUME~1\MAT\LOCALS~1\Temp\MAT07232" (PDF). http://www.levin.senate.gov/newsroom/supporting/2007/PSI.OffshoreTaxBill.021707.pdf. Retrieved 2010-05-27. ^ Liechtensteinische Landesverwaltung (2007-06-22). "Aktuelle Kleine Anfragen – Regierung – Landesverwaltung Liechtenstein". Llv.li. http://www.llv.li/llv-rfl-kleineanfragen-aktuell.htm?reference=98029&Checksum=2B6BB85C0A1A0B72B339579A52D8B1FF. Retrieved 2010-05-27. ^ "Frontline: Tax Me If You Can: Interviews: Carl Levin". PBS. 2004-02-19. http://www.pbs.org/wgbh/pages/frontline/shows/tax/interviews/levin.html. Retrieved 2010-05-27. ^ "Time.com". Time.com. April 14, 2006. http://www.time.com/time/nation/article/0,8599,1183959,00.html. Retrieved 2010-05-27. ^ "USAtoday.com". Asp.usatoday.com. 2004-04-16. http://asp.usatoday.com/news/politicselections/CandidateProfile.aspx?ci=768&oi=S. Retrieved 2010-05-27. ^ "Carl M. Levin (D-Mich.) - WhoRunsGov.com/The Washington Post". Whorunsgov.com. 2010-04-28. http://www.whorunsgov.com/Profiles/Carl_M._Levin. Retrieved 2010-05-27. ^ "Detnews.com". Detnews.com. http://www.detnews.com/apps/pbcs.dll/article?AID=/20061205/UPDATE/612050301. Retrieved 2010-05-27. This page was last modified on 27 April 2011 at 18:49.